London’s Oxford Circus is one of those Yogi Berri-esque ‘so popular no one goes there anymore’ sorts of urban spaces — I once did a little bit there for the BBC with Scottish-Sikh funnyman Hardeep Singh Kohli on “pedestrian rage” on the overcrowded street. It’s just gotten some relief in the form of a diagonal crossing (i.e., “scramble”), modeled on the crossing at Hachikō Square in Shibuya, Tokyo, a place one can easily lose a few hours just watching the action from a nearby donut shop). The video above describes the dynamics and shows the “before.” The impressive “after” can be viewed here. In homage to its Far Eastern inspiration, Mr Johnson struck a two-metre high cymbal as Japanese musicians played taiko drums. As with elsewhere in the city, pedestrian barricades have been removed (“giving shoppers and workers that visit annually around 70% more freedom to move,” notes the BBC). 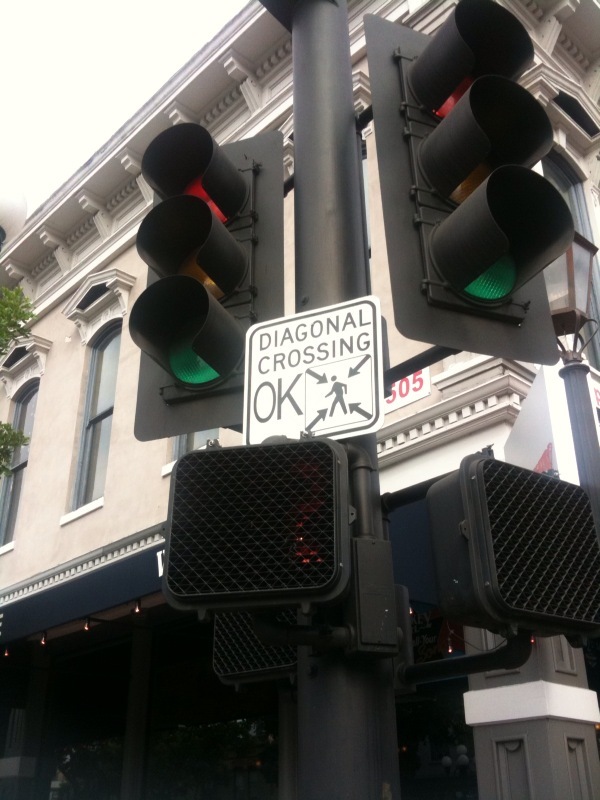 I don’t know precisely when the first diagonal crossing was unveiled, though its popularity is certainly linked to Henry Barnes, NYC’s former traffic capo, who first unveiled it in Denver (where it earned the name ‘Barnes Dance’; he himself noted it had been tried elsewhere previously). It’s hardly common, but does pop up in places with extraordinary pedestrian volumes or some other special circumstances, as in the historic-entertainment district of San Diego, where fellow INFORMS attendee Sean Devine snapped the photo below (alas, I didn’t experience the crossing myself, as I was out looking at seals). Here’s another one, in Toronto, captured in time-lapse glory. Scramble from Sam Javanrouh on Vimeo. This entry was posted on Monday, November 2nd, 2009 at 8:13 am	and is filed under Cities, Pedestrians, Traffic Culture, Traffic Engineering, Traffic safety, Uncategorized. You can follow any responses to this entry through the RSS 2.0 feed. Both comments and pings are currently closed.